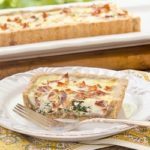 Prosciutto Goat Cheese Tart has a nutty, crumbly crust and a quiche-like filling with spinach and shallots. Serve it for brunch or a light meal. Process pecans, flour, and sugar in a food processor until blended. Add butter and pulse until mixture appears as coarse crumbs. Which together yolk, 1 tablespoon water, and mustard in a small bowl. Pour into flour mixture while processing and continue to process until dough forms a ball. Add 1 teaspoon of water if dough does not come together into a ball. Press dough into the bottom and up the sides of an ungreased 14- X 4- inch tart pan. Bake dough until crust is lightly browned, about 20 minutes. Cool crust on a wire rack. Heat 1 tablespoon oil in a large skillet over medium heat. Add shallots, salt, and pepper and sauté until shallots are softened and opaque. Add garlic and cook for 1 minute. Add spinach to the skillet and toss until wilted. Transfer mixture to a plate to cool. Heat remaining tablespoon oil in the same skillet. Cook prosciutto until slightly crisp. Transfer to a paper towel lined plate to drain and cool. Cut prosciutto into pieces. Whisk eggs, half-and-half, nutmeg, and red pepper flakes in a large bowl. Spread shallot/spinach mixture in the tart crust. Pour egg mixture in tart crust. Sprinkle chopped prosciutto and goat cheese on top. Bake for 30 to 35 minutes, until center is set (knife inserted in center comes out clean). Serve warm or at room temperature.